Send a fun medicne gift. Nothing says "Get Well" like a Medicine Cabinet full of Dr. Hathaway's Prescribed Rx labeled products. Items are packaged in an authentic medicine cabinet that comes complete with mounting hardware and a working lock. 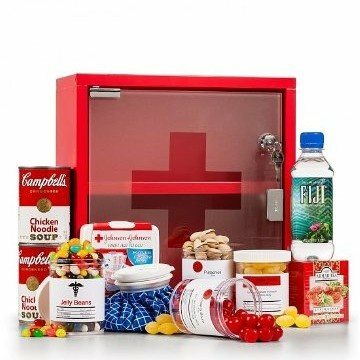 This gift includes the following: Rx labeled get well snacks: Old-Fashioned Lemon Drops, Gourmet Jelly Beans, Chocolate Covered Sunflower Seeds, and Spree Candies, Campbell's Chicken Noodle Soup, Strawberry Tea, Retro Ice Pack, Johnson & Johnson Mini First Aid Kit, and more.